The most common doctrine taught in Christian churches, about the relationship between God and Jesus, is that they are one and the same. Both, along with the Holy Spirit, are considered a single “Godhead.” This three-in-one approach to Jesus’ identity is really just a theory – a dogmatic point of view that did not exist during his time on earth. While most modern denominations claim God is a Trinity, not all do. So, Who is Jesus? — Why does he have so many names? Many languages were spoken during of our Lord’s life on earth, some of which were Aramaic, Hebrew, and Greek, along with their varying dialects. 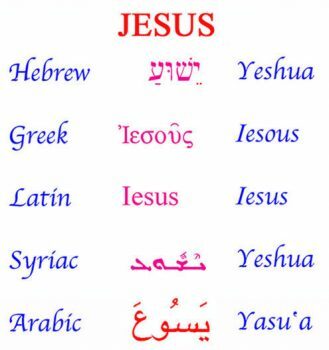 His name is Jesus in English, Iēsous in Greek, and Yeshua (or Yahsuhua, as some few prefer) in Hebrew/Aramaic; those are just some examples. Since there were no last names used in biblical times, a description was sometimes necessary to accurately identify who was being spoken about. He was called by descriptive names, such as the Christ, the Nazarene, the Redeemer, etc. and these words also sounded differently, depending upon language and dialect. The apostle John used a different label to describe Jesus; he called him by the Greek Logos,4 which translates into English as ‘Word’ in John 1:1, and we will investigate this closely, in a moment. The apostle Paul, in his epistle to the Colossians, mentions that Jesus was in existence even before the world was created. “He is the image of the invisible God, the firstborn of all creation; for in him all things in heaven and on earth were created, things visible and invisible . . . all things have been created through him and for him.” (Colossians 1:15–16.) Here Paul establishes that Jesus was the firstborn of all created beings and God used Jesus as the instrument through which everything else was created. This implies that Jesus (the Word) was a servant of God, who carried out the Almighty’s will. As the firstborn of all creation,5 Jesus was God’s only direct creation and, thereafter, he used him as the instrument through which everything else was created, and the Word always credited his father with all that he did. An analogy, of which I often use, is about Frank Lloyd Wright6 the famous American architect, who is credited with the construction of more than 500 homes and buildings, most of which still exist today. Although famous for the structures, he was not the one who manually constructed them; he designed, but others built by his plans. Likewise, God designed the world, but Jesus was in charge of construction. 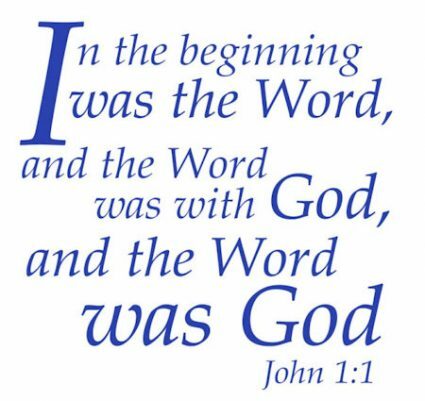 Proclaimers of the Trinity theory use the first verse in the book of John as their strongest proof that God and Jesus are one and the same: “In the beginning was the Word [Logos],7 and the Word [Logos] was with God, and the Word [Logos] was God.” (John 1:1.) On the surface, this statement seems to be a rather straightforward explanation of the relationship of God and Jesus. However, truth does not arise from single Bible verses taken out of context or blindly accepted without research and study. There are many translations of this verse, which give a different meaning. Always remember, a translation, because of its language complexity, is only one translator’s opinion (or group of translators). Then there is this: “In the beginning the Word already was, the word was in God’s presence, and what God was, the Word was” (REB).13 And yet, here is another translation: “In the beginning the Word was existing. 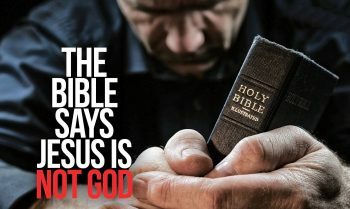 And the Word was in fellowship with God the father. And the Word was as to his essence absolute deity” (WET).14 Besides these four versions mentioned above, there are six more Bible translations listed in the notes at the end of this article that indicate similar thoughts.15 A serious search will reveal others, as well. Biblical author E. A. Watson, writing about John 1:1, stated, “Elohim is a collective noun meaning more than one person, like the English words ‘army,’ ‘family,’ or ‘group.’ Thus, Yahshua [Jesus] is a member of the Divinity as is the Father, showing their duality!”17 So, since some researchers believe Elohim is plural and can mean family or group, let me present another Bible translation of John 1:1: “In the beginning was the Word, and the Word was with Elohim, and the Word was Elohim.” (The Scriptures. )18 In this case, God the Father and God the Son could be inclusive of this family or group, but two separate entities. This particular opinion is presented as still another point of view for you to think about. As stated in the beginning of this essay, these ideas are not presented to start debate about the status of Jesus’ relationship with his Father or suggest any type of conversion of thought, but only to present the opinions of Christians that have a different point of view. We should search the scriptures and learn and decide for ourselves what is true or not. God gave us the free-will to investigate and make up our own minds. All the differences derived from one short verse, such as John 1:1, may seem rather difficult to comprehend, but it would be even more complicated if we were to delve into Greek grammar. But even if we do not get that deep into our Christian studies, someone might wonder, “Why get all ‘nit-picky’ – does it really matter?” Well, maybe! As Christians, we are expected to move on into maturity with our religious beliefs by learning more and, specifically, gaining accurate knowledge. While it is not necessary to actually study ancient languages, we are expected to not get stuck in our adolescent stage of spirituality.21 The Bible encourages us to grow-up and mature in our faith. Note: The First Council of Nicaea (325 AD) called by Constantine I, condemned Arius who taught that Christ was a created being. The emperor then exiled Arius to remove his influence from the council. Unless otherwise noted, scripture quotations are from the New Revised Standard Version Bible (NRSV), ©1989 the Division of Christian Education of the National Council of the Churches of Christ in the USA. Used by permission. All rights reserved. Note: [As used in the book of John] Strong’s Greek #3056. λόγος lŏgŏs, log´os; spec. (with the art. in John) the Divine Expression (i.e. Christ). Strong, James, The New Strong’s Dictionary of Hebrew and Greek Words, (Nashville: Thomas Nelson, 1996). Note: Strong’s Greek #4416. πρωτοτόκος prōtŏtŏkŏs, pro-tot-ok´-os, first-born, first-begotten. Bloomfield, S. T., Recensio Synoptica Annotations Sacrae, (London: C. and J. Rivington Publishers, 1826), vol. 3, pp. 1-3. Harner, Philip, “Qualitative Anarthrous Predicated Nouns,” Journal of Biblical Literature, The Society of Biblical Literature, 1973, vol. 92, no. 1, pp. 81-87. Moffatt, James, A New Translation of the Bible, (New York: Harper & Brothers Publishers, 1935). Wilson, Benjamin, The Emphatic Diaglott, (New York: Fowler & Wells Co., 1864). The Revised English Bible (REB), ©1989 by Oxford University Press. The text has been used by permission. All rights reserved. Wuest, Kenneth S., Wuest Expanded Translation, (Grand Rapids, MI: Wm. B. Eerdmans Publishing Company, 1961). (6) Tomanec, J. L., The New Testament of Our Lord and Saviour Jesus Anointed, 1958. Strong’s Hebrew #430. אֱֱלֹהִים ˒ĕlôhı̂ym, el-o-heem’; plur. of 433; gods in the ordinary sense; but spec. used )in the plur. thus, espec. with the art. ( of the supreme God; occasionally applied by way of deference to magistrates; and sometimes as a superlative:— angels, × exceeding, God )gods( )-dess, -ly(, × )very( great, judges, × mighty. The Scriptures, (The Scriptures Bible), ©2009, Institute for Scripture Research, Northriding, South Africa. Used by permission. All rights reserved. A Jehoval Witness told me Jesus was not God. I kind of believed him, but was always told that they were a cult. Jehovah’s Witnesses do teach that God and Jesus are two different entities. Although I have differences of opinion with some Watchtower teaching, they are correct in many ways. As for being a cult . . . well, to many people, a cult is any denomination different from their own. I never believed that Jesus was the same as God but was afraid to say that to anyone in my church. It is nice to know I’m not the only one that thinks this way. Over the last dozen years I got a dozen different explainations on how they were that same but none made sense. 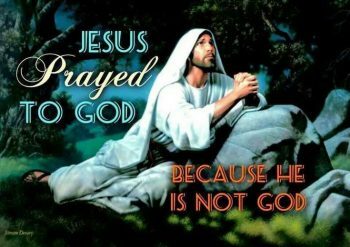 I always thought that Jesus would not pray to God if he was God himself. Thank you for your comment and sharing your thoughts. “Jesus is God” and “The Trinity” were always stumbling blocks in my early Christian life. Instead of just believing what was being fed to me, I decided to make it a major personal study and found that a vast number of Christians did not believe those doctrines, either.